When it comes to business communications, we've got you covered. We can provide you with wholesale carbonless business forms, MICR bank documents, business marketing products and any other related printing so seamlessly that you will satisfy your clients needs and leave them delighted with the process. 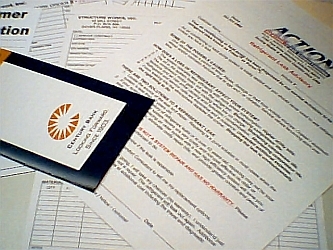 At SEF, Inc., we're experts at wholesale carbonless business forms and business communications printing. But that's only the beginning. To learn more about the many products and services we offer, check out the links below. If you need further assistance please contact one of our customer service representatives at 800.633.1228. Here at SEF, Inc our main focus is wholesale carbonless business forms. We can provide carbonless forms or cut sheet products for your customer as small as 1 1/4" wide up to 22" x 17.5" and anything in between. But we do not stop there. With our digital capabilities we can also produce short run full color brochures, booklets and even full color business forms. We also have added short run digitally printed envelopes to our product mix. If you don't see what you need in the list below, give us a call at 800.633.1212 and just ask. For those of you occasionally need to print a receipt, we have created a fillable PDF that you can download and print out from your computer. Clicking on the upper left hand corner will allow you to fill in your company or personal information. The rest of the areas are self explanatory. Enjoy.